ĐÀ NẴNG — Big data research is the key element to help Việt Nam boost the Internet of Things (IoT) and apply smart urban technology, the rector of the Korea-Việt Nam Friendship Information Technology College, Hoàng Bảo Hùng, said at the opening of the 7th International Conference on Information Science and Technology (ICTST) in Đà Nẵng yesterday. 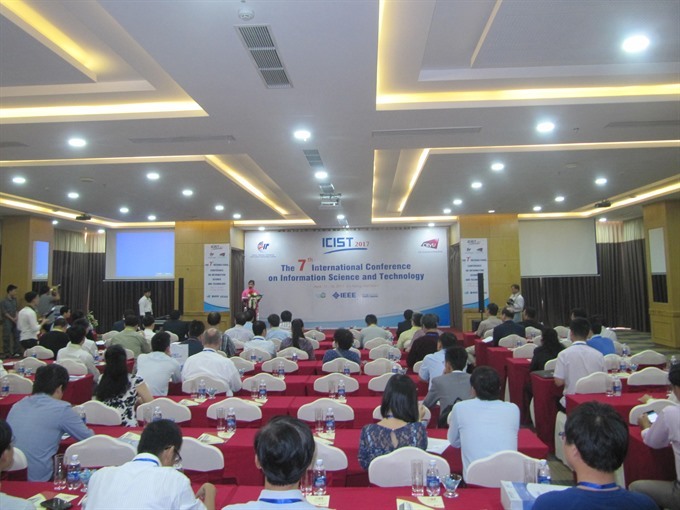 He said Đà Nẵng would be a destination for regular IT conferences that lure top international experts sharing their experience and latest IT research. Some 125 reports from 25 countries and territories will be presented to 1,300 participants at the two-day event on big data, databases, smart systems, education and IT applications. Việt Nam has sent 30 reports – the largest of any participant – on big data, databases, visible light communications and wireless sense security communications networks and computer science to the conference. Professor Sam Kwong from the City University of Hong Kong said research on big data and computer science has a vital role in the internet era, and the conference will help establish Việt Nam’s relationship to IT worldwide. It’s expected that at least 84 reports will be accepted at the conference, and the best will be selected for publication by the Institute of Electrical and Electronic Engineers (IEEE) – the conference’s technical sponsor. Scientists from the Đà Nẵng-based Korea-Việt Nam Friendship Information Technology College also sent five reports on databases, visible light wireless internet (wireless integrated with light-emitting diodes), visible wireless sense systems and quality improvement of wireless systems and network security.